On to today's record. I find this one very curious and fairly fascinating. 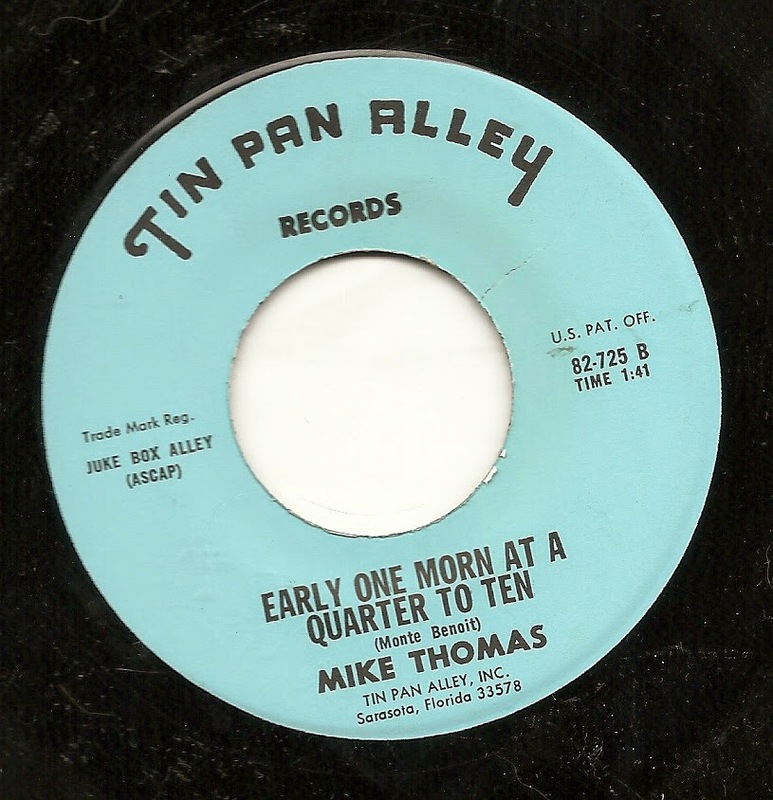 On the surface, it's another tossed-off sounding Mike Thomas number, with the unwieldy title of "Early One Morn at a Quarter to Ten", but upon listening to its lyrics, it sounds to me as if half the story is missing - almost as if the second page of the lyricist's submission got lost on its way to becoming a song. 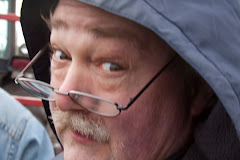 Because the first 104 seconds of the story (all we have here) set up the situation: the singer's buddy quit his job five years ago, and that friend tells his reasons, most of which have to working his tail off, only have the government take their allotted share. And that's it. First, I'm dubious that the lyricist wouldn't have known his "friend" had stopped working for five years (it seems to be offered as a surprising bit of news), but more importantly, where is the punchline? The rest of the story? The explanation of what the friend has been doing instead for five years? What happened to the house? Maybe there's a part two somewhere? 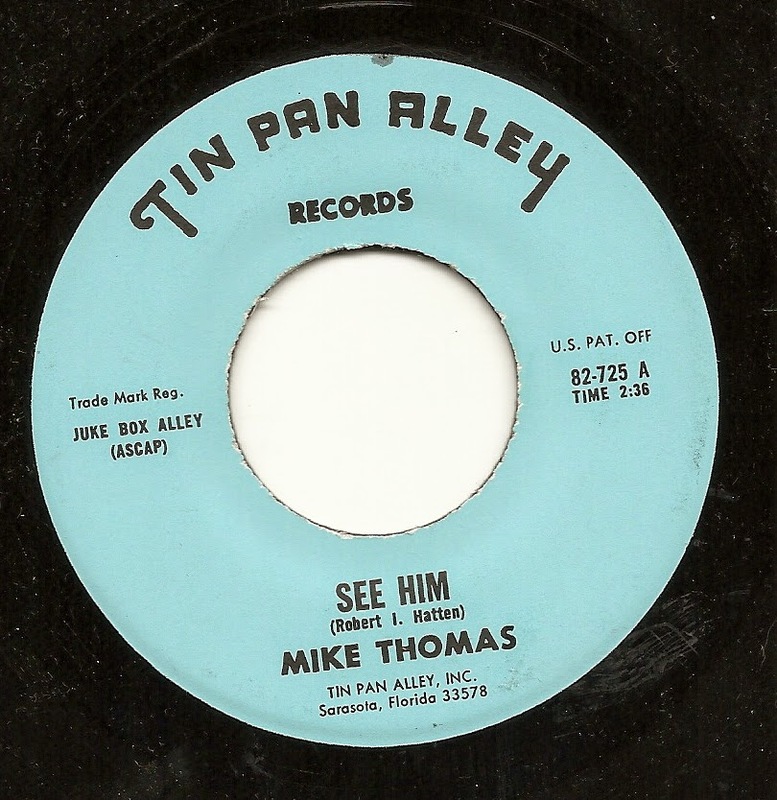 On the flip side is a genuinely sweet set of words about the lyricist's son, titled "See Him". I'm not crazy about the setting that the TPA folks attached to this lyric, and I don't think Mike Thomas was anywhere near up to the task of meeting the emotional level of these words, but they don't really ruin it, either, and the results are fairly affecting, despite the flaws. 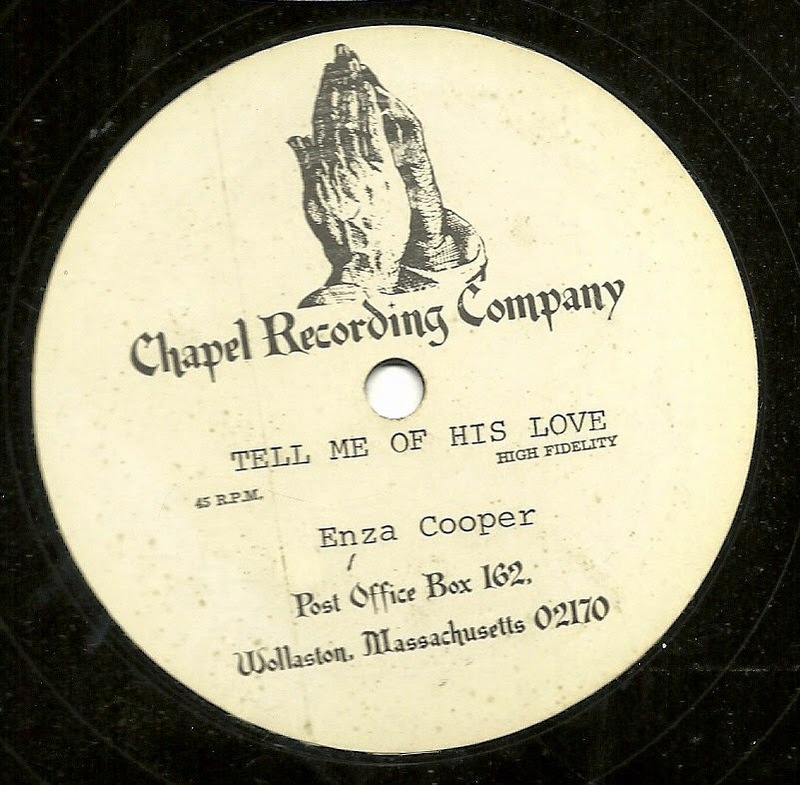 Here, as the promised follow-up to last Sunday's post, are the other two Chapel Recording Company acetates. You can read more information about these records, and see a truly amazing scam letter that came with one of them here. 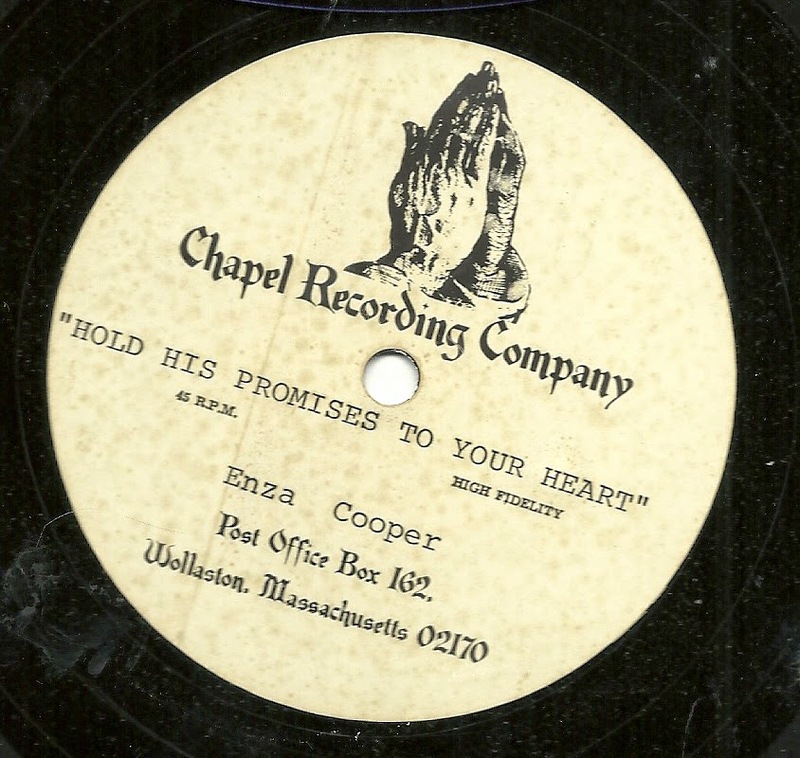 The third acetate contains a song called "Hold His Promises to Your Heart". This has considerably better sound on the vocal than did the first two records I shared on Sunday, and the backing track (one I'm not absolutely sure I've heard before) is very clear, compared with the sound of many later Halmark releases. Finally, there is "Fallow Ground". This one is built on one of my favorite Halmark backing tracks (again, sounding nice and clean here) - a big booming, bombastic opening that gives way to what passes for a soulful arrangement in the Halmark universe. They didn't use this track as often as many of their other records, but I'm always glad to here it. And again, the megaphone from Sunday's tracks seems to have been retired for this track, as well. Several months ago, I bought a batch of song-poem and related items, all of which have song-poet Enza Cooper as the common thread. These items contained four ten-inch Acetates, which, being a different size than most of the records I buy, ended up in a different spot than virtually everything in my collection, and sat, sort of forgotten, for nearly a year. They are all one sided, and came in record sleeves with the name of the songs on each of them. I came across them while looking for something else, and they are a revelation. While these four records have long been documented on the AS/PMA website, I don't believe they've ever been shared on line or among collectors. 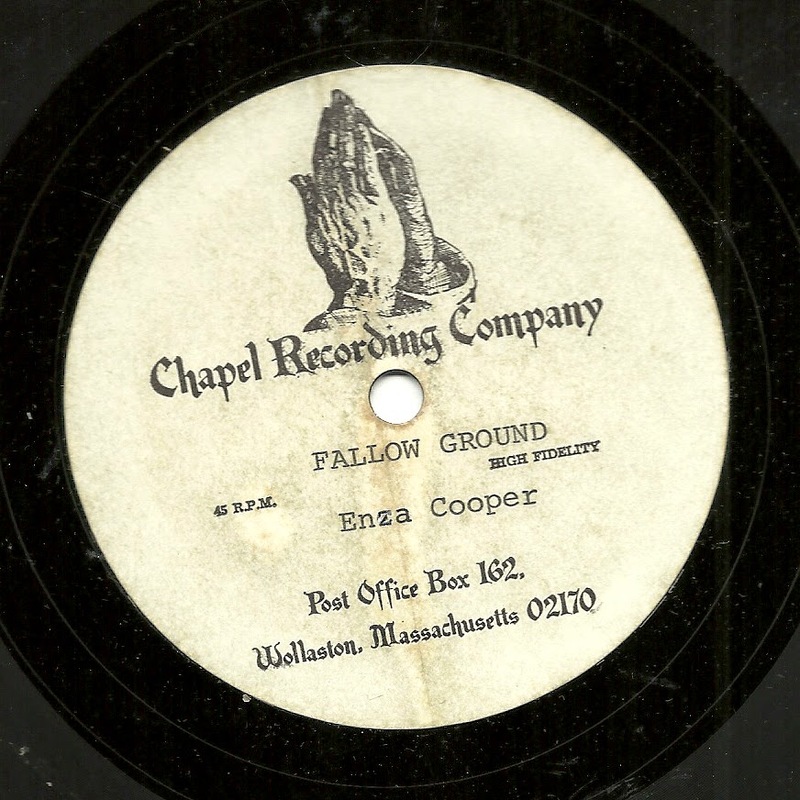 These four records make up more than half of the documented (on AS/PMA) records on the Chapel Recording Company, one of Ted Rosen's song-poem mills before he settled on the Halmark (AKA Hallmark) label in the late 1960's. What I find most fascinating about these records is that, already by this point, Rosen was employing the same backing tracks that were used ad nauseam during the Halmark years. And while these records suffer the higher level of noise often heard on acetates, it strikes me that the backing tracks actually sound a little cleaner and clearer than on many Halmark releases. Perhaps he hadn't worn out those tapes at this point, and by 1975, had worn them out enough that they were in poorer condition? On the other hand, what is with the vocals on these records? They sound like they're being sung through a megaphone, particularly in the second track featured. 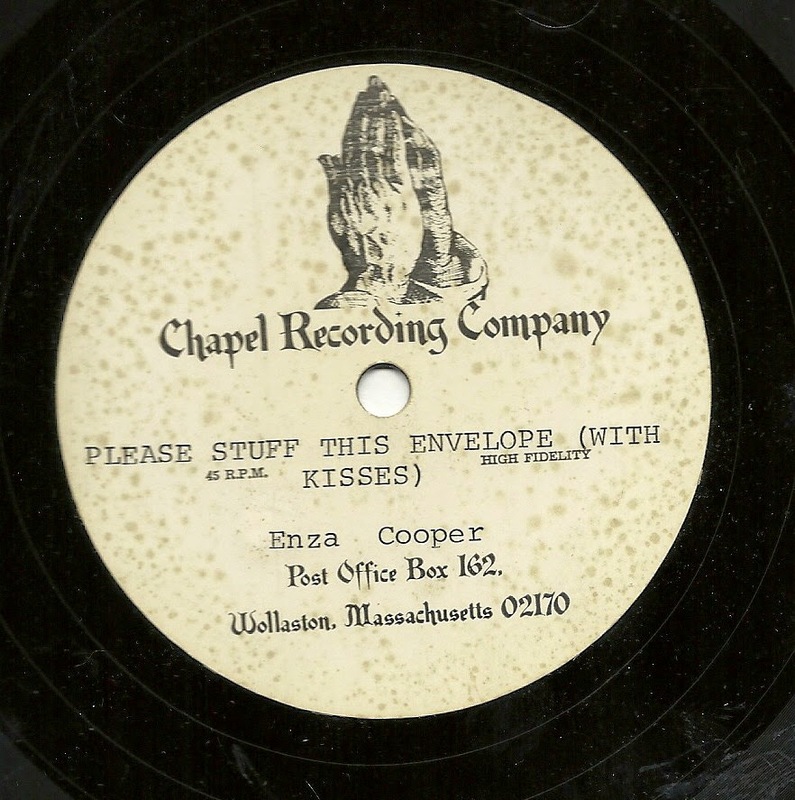 First up is the clunky-titled "Please Stuff This Envelope (With Kisses)", with a backing track that any Halmark fan will recognize immediately. Even more familiar will be the backing track to "Tell me of His Love", with the aforementioned vocal which sounds like it was recorded over a phone receiver. See below the label scan for a fun postscript. 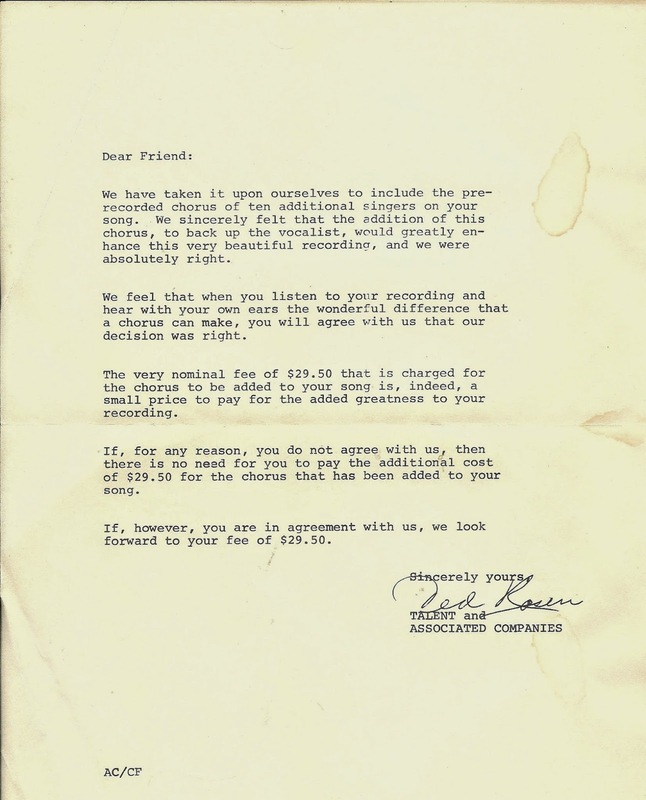 Along with these records came the following letter, sent to the song-poet, from Ted Rosen himself. This letter is quoted in its entirety at the AS/PMA website, but it's fun to see it, anyway. The person I bought these records from called this a "nice" letter, but in reality it's another play for more $$ from the song-poet. He claims to have added, at his own expense, a chorus of ten singers to her recording session. It's up to her to pay the extra $29.50, of course, but he did spring for them. Only he didn't. The singers were already there, along with the rest of the track that he'd be using over and over again, for full profit and no further cost, for God knows how many more years. Part two, featuring the other two records, will follow in a few days. 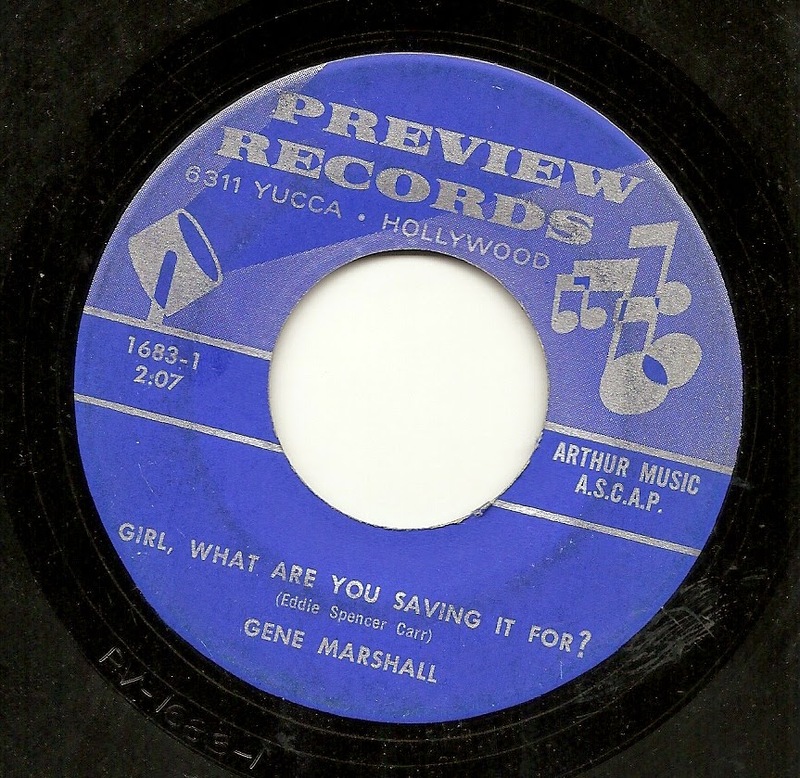 Is there any question about whether Gene Marshall could rise to just about any occasion, and deliver a vocal which matched the subject matter just about perfectly? Today's lyric, the very directly titled "Girl, What Are You Saving it For? ", required a bit of sleaze, particularly on that very title line, and Gene delivers. I must say, as well, that whoever wrote the music and directed the track did a good job of hitting something a bit darker than the typical Preview record, as well. If only they'd skipped those god-awful white-bread backup singers - they ruin the mood. Do you suppose this song-poet presented his lovely lady with this record, in the hopes that it would be the final piece of the puzzle, in terms of him getting what she was saving? Upon hearing the opening moments of "Hey! Pretty Girl", one could be forgiven for thinking there's another sexual come-on in this lyric. But that opening guitar gives way to a more standard Preview track, with both the music and vocal sounding like dozens of other Preview discs from this period. 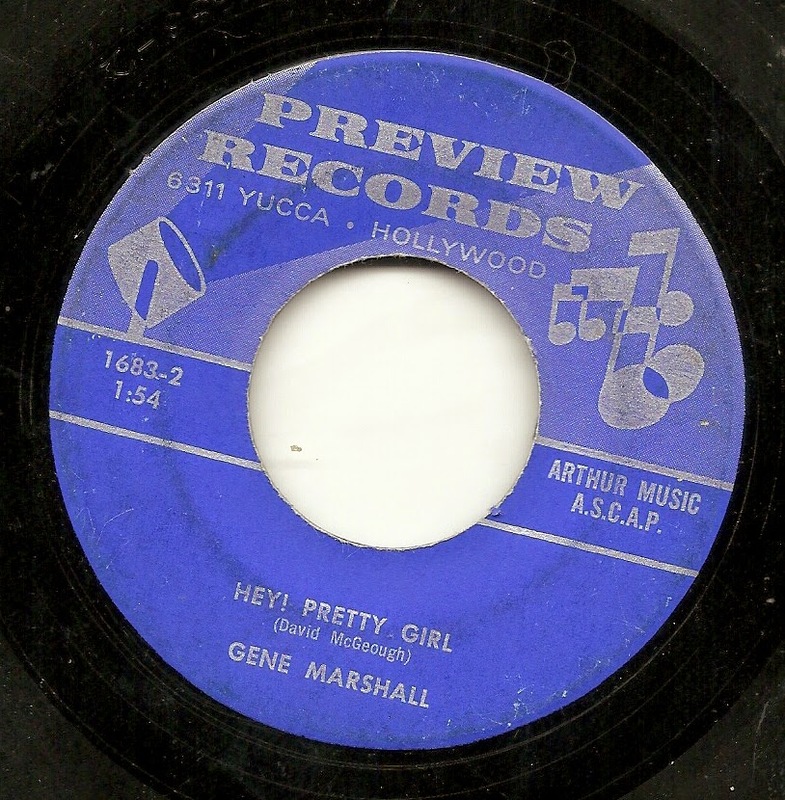 What stands out for me here, actually, is a rare flub from Gene Marshall, between 1:10 and 1:15, where the band modulates up a half-step and Gene holds on to the note he was singing, until well after the chord change is complete. It sticks out both as a moment of bad sounding music and as a truly unusual event in a Gene Marshall performance.